14664 Private Sidney Darch Cruwys of the 9th Battalion, the Devonshire Regiment. Son of George and Hannah Cruwys of Town Cottage; brother of Frank (see below). Born in Templeton in 1897. Died 6 September 1916 aged 20. T1/3705 Private Frank Cruwys of the Field Ambulance arm of the Army Supply Corps; attached to the 51st Field Ambulance of the Royal Army Medical Corps. Son of George and Hannah Cruwys of Town Cottage; brother of Sidney (see above). Born in Templeton in 1898. 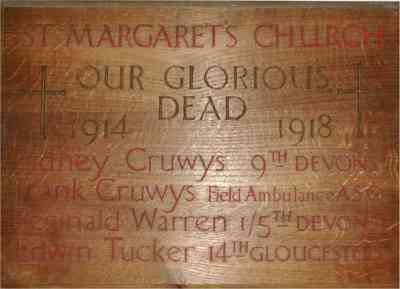 Died 9 February 1917 aged 20. 55062 Private Reginald Warren of the 1st/ 5th Battalion, of the Devonshire Regiment. Son of William and Eva Warren of Coombe Mills. Born in Woolfardisworthy in 1896. Died 15 September 1918 aged 22. 20914 Private Edwin Tucker of the 8th Battalion, the 14th Gloucestershire Regiment. Son of Samuel and Harriet Tucker. Born in Templeton in the December Quarter of 1889. Died 18 September 1918 aged 29.